These are the memories of a young girl caught up in the turmoil of China’s Cultural Revolution in the 1970s. Ling, the daughter of a surgeon, lives a relatively privileged life within the hospital compound, venturing out mainly to go to school, comfortably assimilating both the cult of Mao the great leader and her father’s admiration for America, embodied in a picture of the Golden Gate Bridge and regular evening English lessons. Gradually, as the political paranoia of the Maoist assault on ‘bourgeois values’ gathers momentum, the family’s life becomes more and more constricted and impoverished. Comrade Li commandeers father’s study as a political office, while father is redeployed cleaning the hospital toilets. Within the hospital, friends are denounced and humiliated in public meetings, beaten and dragged off to jail or ‘re-education’, homes are stripped of anything of value; and the Golden Gate Bridge is hidden behind a portrait of Mao. Outside, the economy collapses, and only the Red Guards escape the indignity and desperation of rationing. 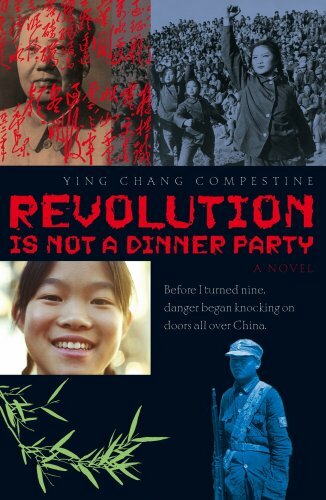 As a political history, Ying Chang Compestine’s novel, based on her own experience, and endorsed by Amnesty International, rings true. But its strength is its personal dimension, its depiction of the anger and love that sustains Ling and her father and mother in their struggle at school and at work: her father’s patient, courageous and inspiring adherence to his family, the values of his profession and the future of his country; and Ling’s fierce refusal to be cowed by classroom threats and ostracism.